Islamabad – Chinese New Year is the longest and China’s most important traditional holidays. On this festival, homes and streets are lightened with red lanterns to celebrate happy life. Also known as Spring festival, it is an occasion for family reunions as the traditional activities include the family dinner, sharing gifts with parents, children and other relatives. The most traditional way is the red envelopes filled with cash given to family members. An important tradition of New Year is to give red envelopes with cash to children which symbolizes of good luck. Guests at the Chinese Food Festival in Islamabad on Chinese New Year eve. 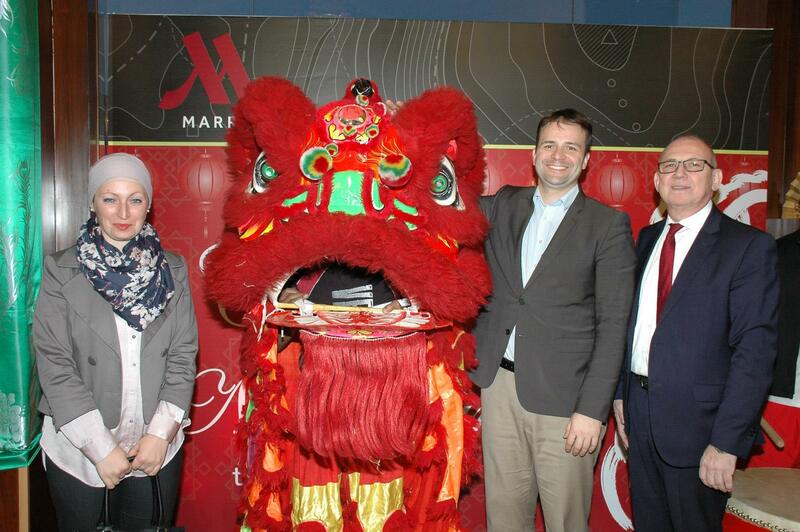 A Chinese food festival and enchanting cultural performances marked the Chinese New Year in Islamabad, Pakistan. The food festival was arranged on the eve of Chinese New Year to welcome the Year of Goat and to celebrate some of the best cuisines of China. The menu included golden mushroom cucumber salad, shrimp on toast, duck rolls, prawn bowls, beef in black pepper sauce, fish lemon, glass noodles, fruit cuts dipped in chocolate sauce. The event was organized by Islamabad Marriott Hotel at its Dynasty Restaurant. Chinese Ambassador Sun Weiding inaugurated the event. Regional General Manager of Marriott Hotels, Pakistan, Mr Hartmut Noack greeted the guests which included members from the diplomatic and Pakistani communities and Speaker of the National Assembly of Pakistan Sardar Ayaz Sadiq. Leaders from both sides vowed to boost more bilateral exchanges, trade volume, cultural cooperation and people-to-people contacts in the year 2015. The Year of the Goat is the eighth animal in the 12 year cycle of the Chinese Zodiac calendar. In the Year of the Goat, which starts from Feb 18, brown, red and purple are the favourite colours and the lucky numbers are two, seven, 27, 32. Meanwhile, the lucky flowers are carnation primrose, Mr. Hartmut elaborated. Tayyab Usmani and his crew of performers from a local mixed martial arts (MMA) club were behind the traditional dragon and lion dances and put up an exciting show at the entrance of the hall. The red dragon, with its fiery expression and traditional dance was also a highlight of the evening. Chinese Food Festival in Islamabad on Chinese New Year eve. “It’s a great chance for us to get together and since the Chinese New Year is coming, we would like to share our joy with all our Pakistani friends. May they enjoy peace and prosperity in this coming year. These are the best wishes from the Chinese people and from me,” His Excellency Ambassador Sun Weidong said on the occasion of Chinese Food Festival in Islamabad. The Chinese Ambassador said that like him, many Chinese people will spend the New Year in Pakistan, but they will not feel lonely because Pakistan is their second home. Speaking of the significance of the Chinese New Year for the people of China, he said that in these 40 days, 3 billion people, that is half the population of the world, was expected to travel from their workplace to their family homes, the largest flow of travelers at any one time in the world. His Excellency Ambassador Sun Weidong, in his address on the occasion of cultural performance, informed the audience that 2015 is the China-Pakistan Year of Friendly Exchanges, and President Xi Jinping will soon be making a state visit to Pakistan. On the Festival Day, a magnificent cultural performance by the Qinghai Art Troupe was held at the Pakistan National Council of the Arts (PNCA) in Islamabad. The event was organized by the Embassy of the Peoples Republic of China. Pakistan’s President Mamnoon Hussain and his wife were the Chief Guests on the occasion. The great ethnic mix in the Qinghai province was evident in the various dances and acrobatics performed at the celebration. The rich variety of the troupe’s dresses and headgears reflected the influence of Islam and Buddhism, as the province neighbours Tibet and Xinjiang; ethnic minorities constitute just a little less than half the population of this province. The performances were varied, and in the quintessential Chinese way, executed with perfection. The dances were an interesting mix of acrobatics and balancing skills, sometimes with plates and other times with hula hoops. In order to integrate Pakistani culture into the show, they had local groups perform the Kalash ethnic dance, and Sindh’s Jhoomer. The evening wound up with a joyful rendition of Sohni Dharti by a talented singer of the Qinghai troupe. The group of Chinese artists mesmerized the viewers with their stunning performances presented with finesse and representing variety of fetaures of Chinese culture and heritage. The event began with a performance on the beauty of ‘Hua’er’, a flower that conceals the Qinghai landscape. One group performed the traditional Kangba Tibetan dance. A girls’ troupe, representing the ethnic people of Salar, presented a compelling act. Traditional vibrant costumes embellished with motifs and prints represented different parts of China, such as Han, Hui, Tu, Salar and Mongol. The Pakistani troupe performed on the Sindhi Jhoomer dance and another performed clad in traditional attire from the Kalash Valley. Chinese art troupe perform in Islamabad. A gripping performance by Chinese artists in Islamabad. A beautiful performance by artists at Chinese Culture Festival in Islamabad. On the festive occasion of Chinese Spring Festival (starting February 19,2014), Senator Mushahid Hussain, Chairman of Pakistan-China Institute, conveyed his best wishes and new year greetings to Chinese people all around the global on the festive eve of Spring Festival starting February 19,2014. He said “Chinese people’s dedication and commitment for economic and scientific achievements is worth learning, its role for world peace and contribution for global development is worthwhile”. He said Pakistan and China’s harmonious relation achieved tremendous progress in 2014 with state level meetings, cultural exchanges and academic cooperation. he hoped that 2015 would witness further achievements as “2015 is the year of Pakistan China Friendly Exchanges that marks the beginning of activities enhancing cultural and people to people contacts between the two brotherly nations”, Mushahid added. “In 2015, the year of goat, Chinese president Xi Jumping’s visit to Pakistan would further boost friendship between Pakistan and China- the two traditional partners, and time-tested allies.” Deeper cooperation of Pakistan China economic corridor, Silk Road initiative would bring prosperity and development to the region.